I adore coconut cake with vanilla frosting! So simple but so good! Yummers, this is the 2nd cake recipe today. I don't need much of a push to make desserts. I love my sweets, they just are catching up to me over the winter. That sounds very good. I sometimes miss being able to eat cake, cookies and all the other treats I used to eat. The boys got lucky on that one, better than buying junk at the store for sure. MMM, I might have to add this to my domestic repertoire. But I'd need to double everything for my boys as this would not last a day in my house. Had to copy recipe and will give it a try. Thanks for sharing. Do you know that I can't ever hear/see bundt cake without thinking of that movie My Big Fat Greek Wedding. Did you see that one? So funny. Oh my gosh, this looks awesome! I think I will make it. Yum. I'll have to keep this one. I might add a chocolate ganache too! How delicious this sounds! I didn't like coconut as a child, but I do now! This does look good! I just made cookies for my husband on his last day of work for this Thursday. I still have to decorate them, and they'll go in the deep freezer until it's time to take them. Mmmm! With the sour cream I'll bet it was divine. Thanks for sharing. Wow coconut and almond are mixed! Sound so yummy! Thanks for this recipe. Oh, I can't look! Hubby is fasting for his colonoscopy tomorrow. It's been so hard cutting out eggs, dairy and yeast for him ,too. Sounds dreamy! And the perfect antidote to mid-winter blues. This sounds good to me. I'm having coffee right now, a slice of cake would be just perfect! I can't eat cakes and such as I have to watch my weight but if I could, I'll bet I would devour that whole cake. It surely looks delicious. I really need to try this. I made my husband buy a bundt cake pan six years ago. I have yet to use it! I'll bet your family really enjoyed it! Yum- thanks for the recipe- it looks delicious! 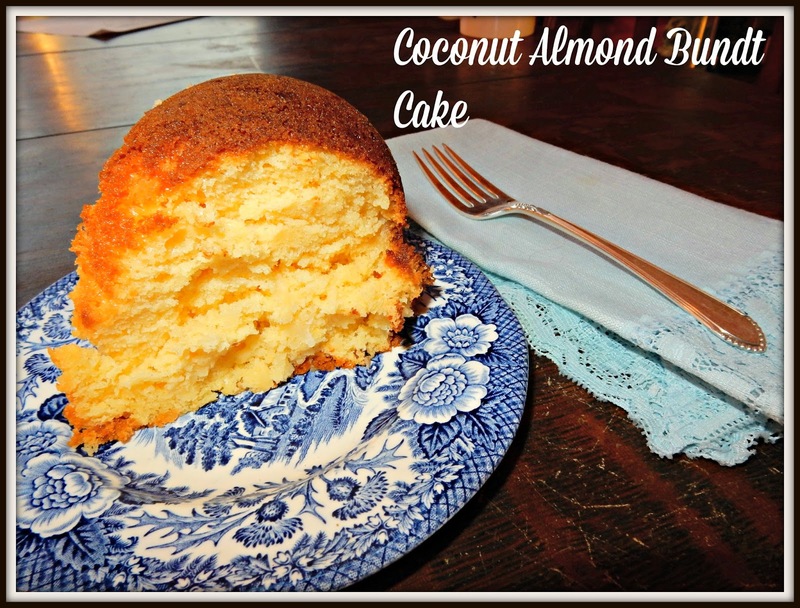 Coconut almond sounds even better than chocolate and not many things do. ohhh that sounds sooooo good! I wish we had some right now. WOW~! your boys are growing up so fast.. IT's so cold here in Iowa.. Went outside this morning to feed the birds.. Ouch~!! the wind and cold~!~! Ta Ta For Now from Iowa~!~!